The mechanism is sold separately and is Product #RC800. It needs a separate servo or push/pull linkage mechanism to operate the bomb drop. Creative use of a flap servo or rudder could be considered if you have no more available channel space on your radio receiver. Very little throw is necessary to release the bomb. Servos as small as 2.2 gram handle it just fine. Mechanism includes an extra clip for use on what ever you like. These are sold individually and should retail for $6.99 each. See Photo and they are now available. 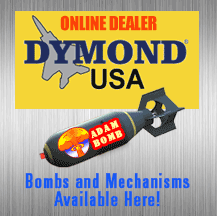 There is a “combo” also available Product #RC850 and includes one bomb and one mechanism. It should retail for $13.98. Adam Bomb release mechanism and extra clip for release mechanism side view. AN-M64 500lbs Bomb on a 1/7 scale or AN-M66 2000lbs on a 1/12 scale. Product # RCAN500 is a package of two halves or one Adam Bomb. They are only currently available in olive green. This product code does not contain the drop mechanism. The mechanism is sold separately. No Assembly is required for the Adam Bomb. It is ready to drop. Just clip the halves together. Made of durable polyethylene plastic. They are light weight, approximately 26 grams empty without payload inside. Dimensions are 6 inches by 1.5 inches. This size translates into a 1/7 scale 500lbs bomb or a 1/12 scale 2000lbs bomb. 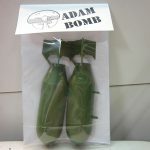 The Adam Bomb sold individually should retail for $6.99 each. These are available now and are UPC coded for Point of Sale retailers. So Retailers please contact us.